Here's a cheap and effective way of doing pickups from Ted Scannell, using some thin phosphor-bronze wire and some bits of plastic tube. The plastic tube can be set right across the frames, or if you haven't got room right across, can be set individually provided you get the frame collars on each side tight enough to ensure a degree of axial stablility of the inner tube. inhibit movement of the pickup in undesirable planes. The pressure on the wheel tread is such that crud will not accumulate on and around the pickup area. If you get the tip of the pickup pointing towards the wheel axle, the pickup will perform in exactly the same way for clockwise and anticlockwise wheel rotation. 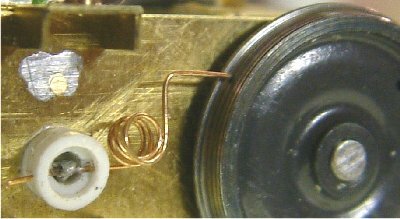 The coil of the pickup wire should be wound around a suitable former, e.g. a 1.5mm or 2mm drill shank. The resulting coil will end up with a diameter larger than the former, so you might need to experiment to get a size that suits your application.